Amazon, Newegg, and Walmart have started to sell Intel’s Crimson Canyon NUC that is based on Cannon Lake processors produced using the company’s 10 nm process technology. Availability of the NUC8i3CY-series UCFF PCs at major retailers indicated that Intel is making its 10 nm CPUs in rather sizeable volumes. 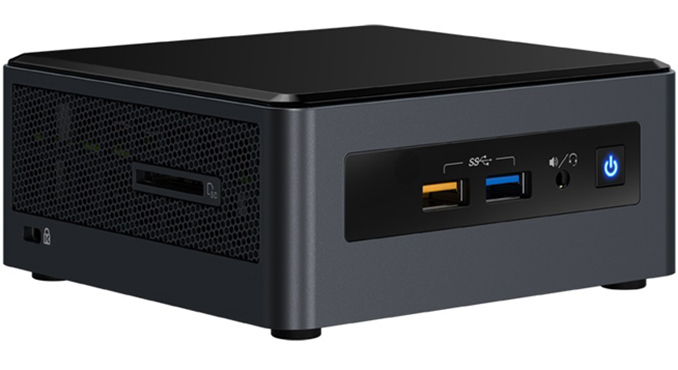 The Intel NUC8i3CY-series UCFF PCs are powered by Intel’s dual-core Core i3-8121U processor paired with soldered-down 4 GB or 8 GB of LPDDR4-2666 memory and AMD’s Radeon 540 dGPU (codenamed Lexa, based on Polaris architecture featuring 512 SPs) with 2 GB of GDDR5. The computer is equipped with 1 TB SATA hard drive, but it also has an M.2-2280 slot for a SATA or a PCIe SSD. When it comes to connectivity, the new NUCs are outfitted with Intel’s Wireless-AC 9560 CNVi 802.11ac Wi-Fi + Bluetooth 5 solution that supports up to 1.73 Gbps throughput over 160 MHz channels. In addition, the systems have one GbE, two HDMI 2.0a outputs, four USB 3.0 Type-A ports (one supporting charging), an SD card reader, a TRRS audio connector for headsets, and a digital audio connector for 7.1-channel sound systems. Intel's NUC8i3CYSM and NUC8i3CYSN UCFF PCs were announced several months ago and were available from smaller retailers, possibly because the volumes were not large. Availability at Amazon and Walmart indicates that Intel can now offer relatively large volumes of its chips produced at 10 nm node. When it comes to performance, Cannon Lake has its perks, such as AVX-512 support, though they may not be that obvious in the SFF space as they are in the HPC/HEDT space. Obviously, AMD’s Radeon 540 should also be faster than Intel’s UHD 630 Graphics in games, but keep in mind that when it comes to media playback Intel’s contemporary iGPUs have certain advantages over AMD’s Polaris (e.g., VP9 10-bit decode, support for sophisticated copyright protection methods that require Intel’s SGX, etc.). The Intel NUC8i3CYSM with 4 GB of RAM and 1 TB HDD currently costs $540 at Amazon.com, which is in line with MSRP of $530 announced in August. Newegg sells the same product for $533.6. Meanwhile, Walmart carries the version with 8 GB of RAM for $570. By the way, despite a disabled iGPU Core i3-8121U has a *much* lower turbo frequency than Intel's 14nm equivalent, Core i3-8145U, which has a max turbo of 3.90 GHz (+700 full MHz) although it also has a functioning 620 iGPU with a 300 MHz to 1 GHz frequency. Yeah I have to agree. Even if it's downclocked and undervolted the GPU will be eating ~30 watts or more by itself. The combined figures mean you might as well build a compact system with a 2400GE (or down-TDP 2400G) with some fast RAM. I strongly doubt these CPUs lack an iGPU, since that would suggest a redesign. It rather appears that Intel decided to disable the iGPU due to either low yields, low frequency and power efficiency (this CPU has 700 MHz lower turbo clock than Core i3-8145U, Intel's 14nm equivalent, despite zero power draw from its iGPU...) or perhaps a combination of all three.